Even though evenings and mornings are already cool, afternoon sun still heats like during the sumer. It allowed me to create another, summer dressup. I put on a pretty original dress which I found in a second hand which doesn't exist anymore. A dress has a warm, beige color and a red strings sais "smile is better", (which string should become my motto!). It interacts nicely with a red jacket (btw coming from the same second hand!). To break a little this color "warmth" I chose accessories in a red and blue colour. 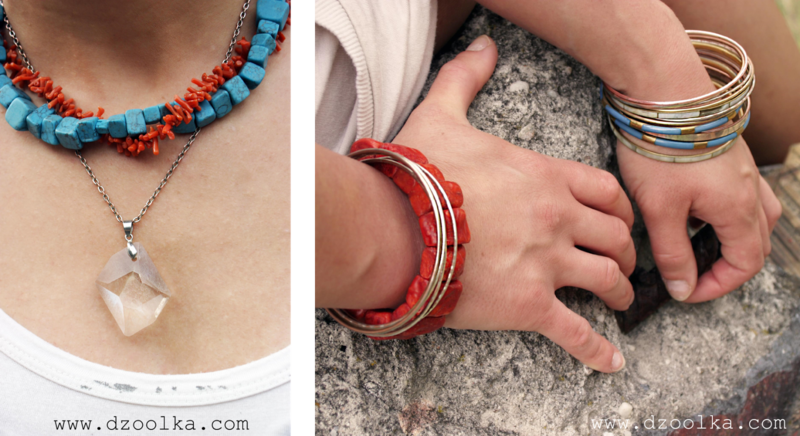 You can see necklace and bracelet made of real coral, necklace of turquoises and my numerous bracelets. Figure on the picture on the dress resembling an Indian, so cowboy boots that I have on my feet match it perfectly! In order to not feel in this outfit "too naked" because of plunging neckline of the dress (which is plunging even after I shorten strapless), I took openwork scarf which, tanks of tassels, resembles cowboy style. Handbag, a small postwoman, matches to cowboy boots by it style and by a color to styling totally.